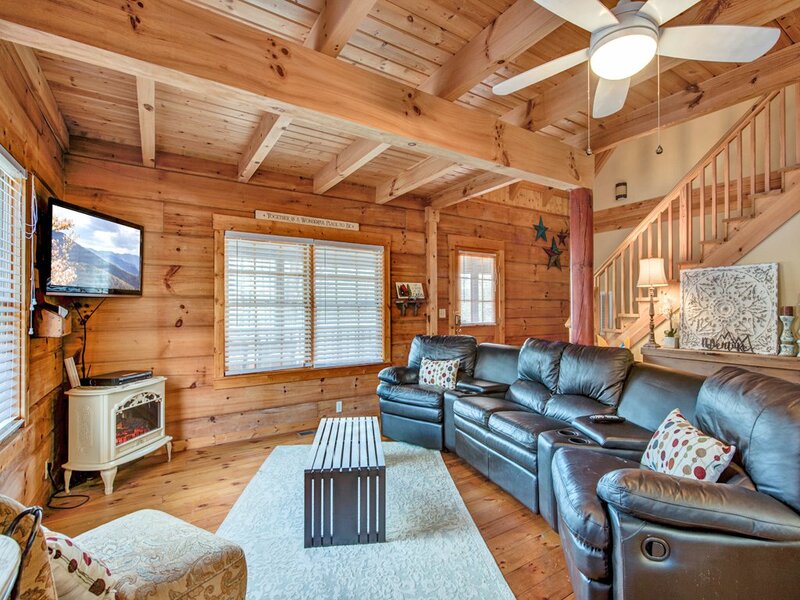 Just ten minutes from downtown Gatlinburg, Black Bear Hideaway makes it easy to experience everything the area has to offer—including the serenity and beauty of the Great Smoky Mountains. 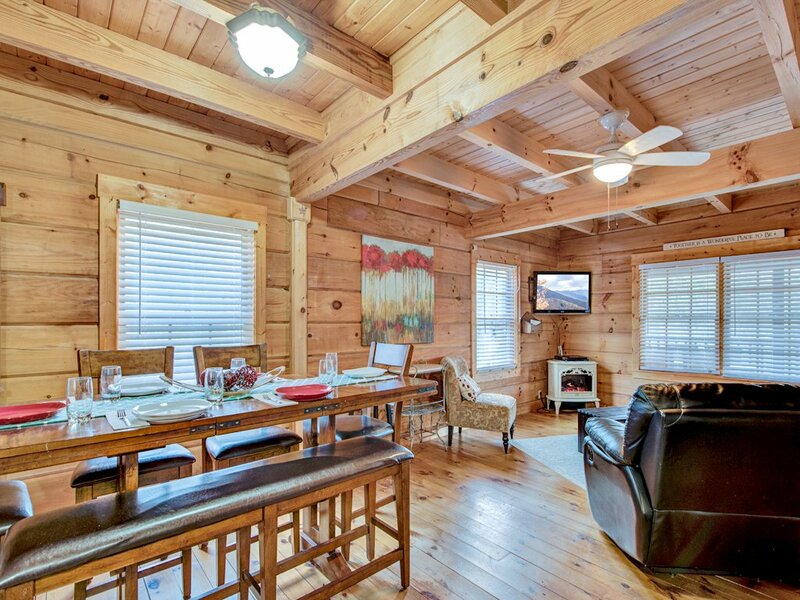 Despite its convenient location, the three-bedroom log cabin feels blissfully removed from the hubbub of the everyday. 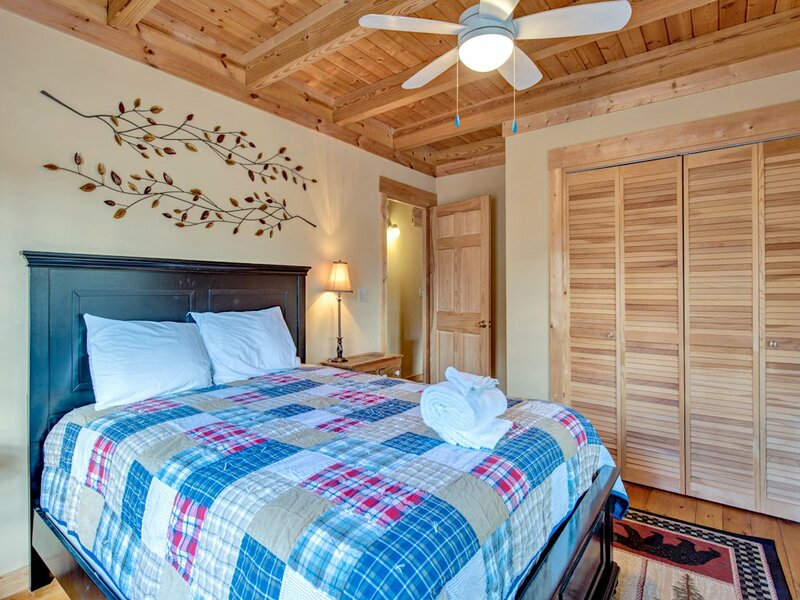 Black Bear Hideaway has both a front porch and a rear deck where you can relish the fresh breeze, the singing of thrushes and warblers, and the sight of the mountains beyond the woodlands. 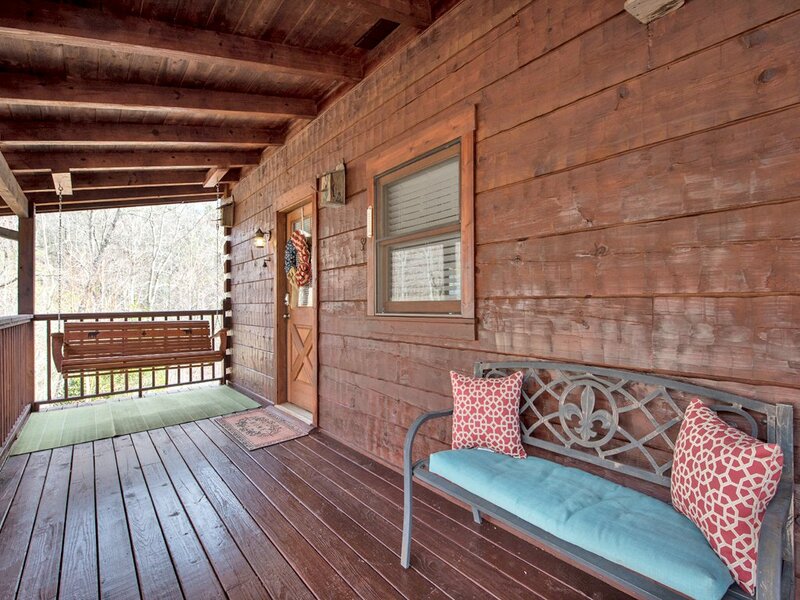 You’ll find it tough to resist the romance of the porch swing at night: After the kids are asleep, slip outside with a drink and snuggle with your special someone while gazing up at the stars. The deck includes a table where you can enjoy a meal alfresco. 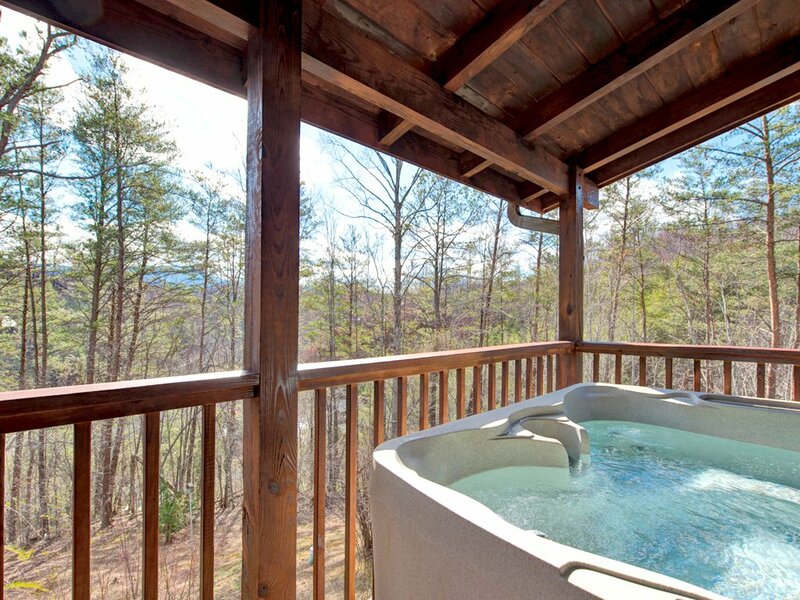 And perhaps the best way to soak up the natural beauty is while soaking in the deck’s hot tub; its massaging jets of water will feel especially fabulous when you return from a day of skiing, hiking, or white-water rafting. 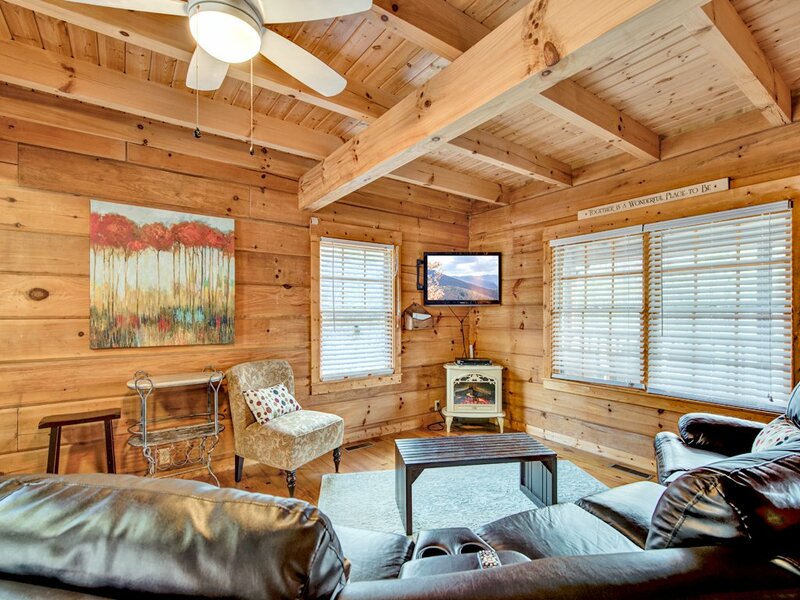 Inside, Black Bear Hideaway is just as relaxing and restful. 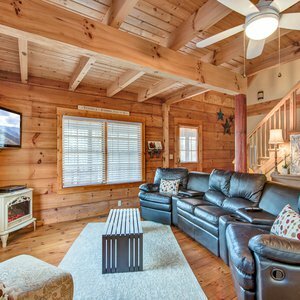 The charm of the great room’s wood-planked walls, floors, and beamed ceiling is rivaled only by the comfort of its large sectional sofa. 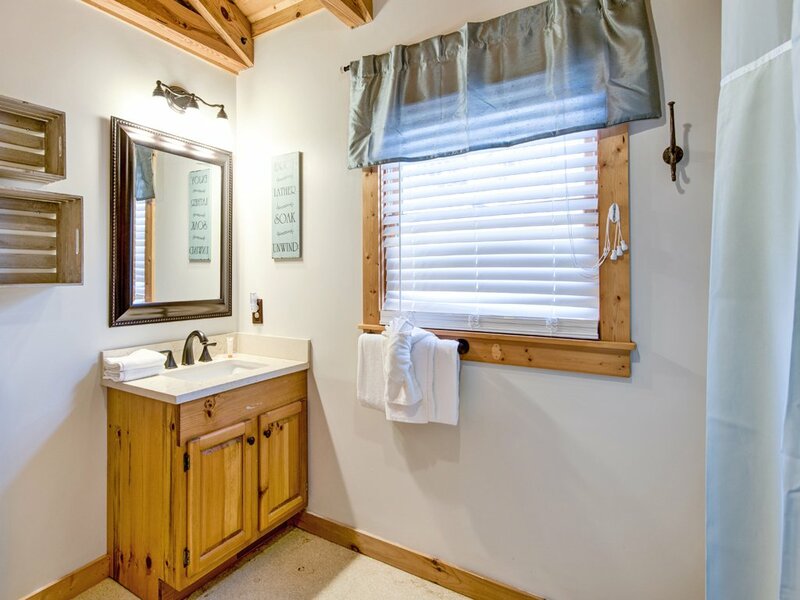 Sink back and watch a movie on the large flat-screen TV, play Pictionary and charades, or take advantage of the free WiFi to surf the web. The dining table’s chairs and bench are as well cushioned as the sectional, so you’ll enjoy lingering long after your meal is over. Once the dishes are cleared, set up your Monopoly or Scrabble board, and let your family meal segue into family game night. 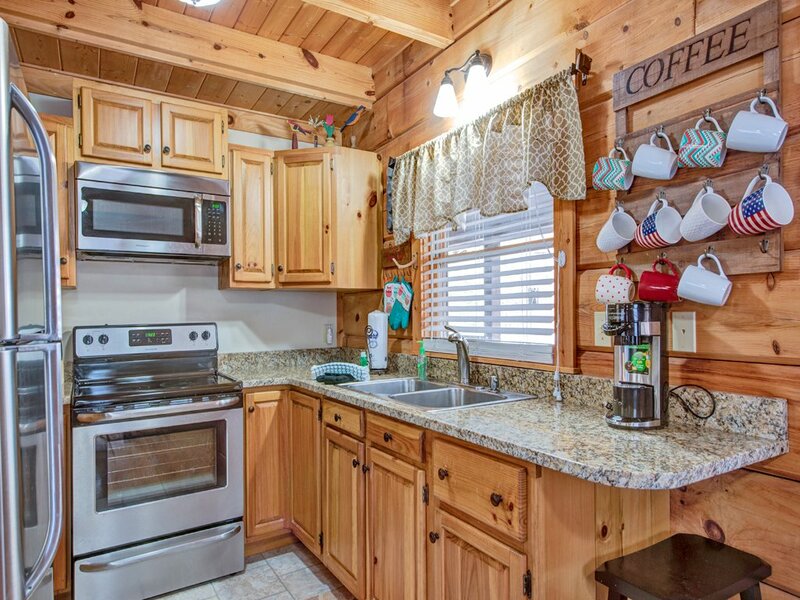 As for the meal itself, the kitchen is equipped with all the appliances, cookware, and tableware you’ll need, whether you’re serving a multi-course feast or reheating leftovers from the previous evening’s restaurant meal. 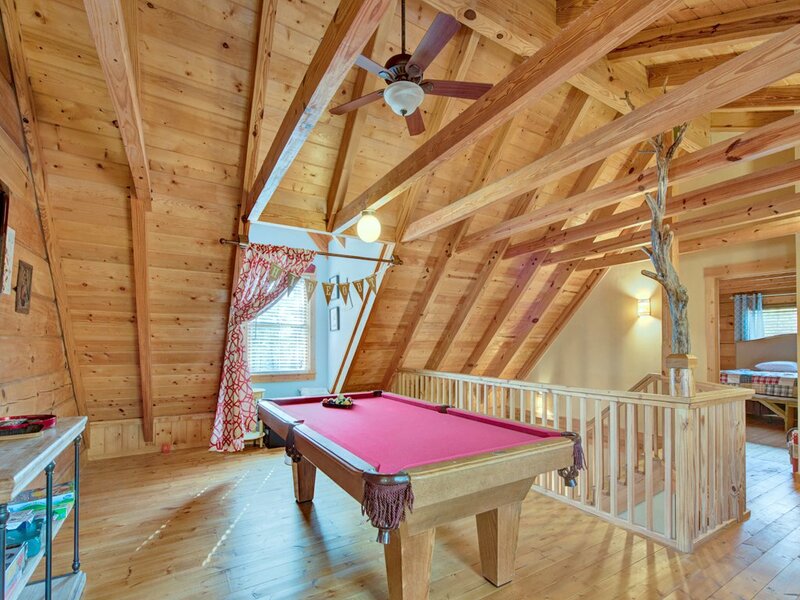 If you enjoy shooting pool, head upstairs to the loft’s game room, which features a full-size billiard table. 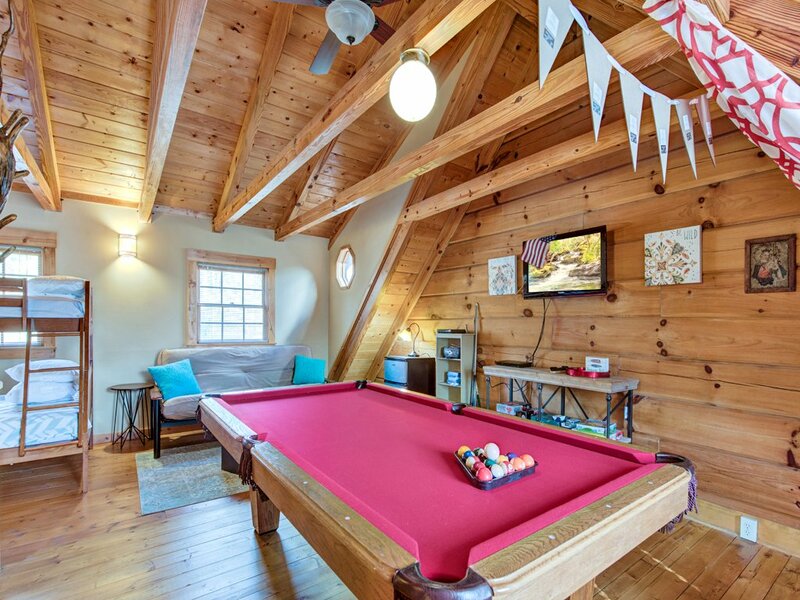 Even if you don’t play pool, the game room is a fun space for hanging out: It has its own flat-screen TV and a stereo. 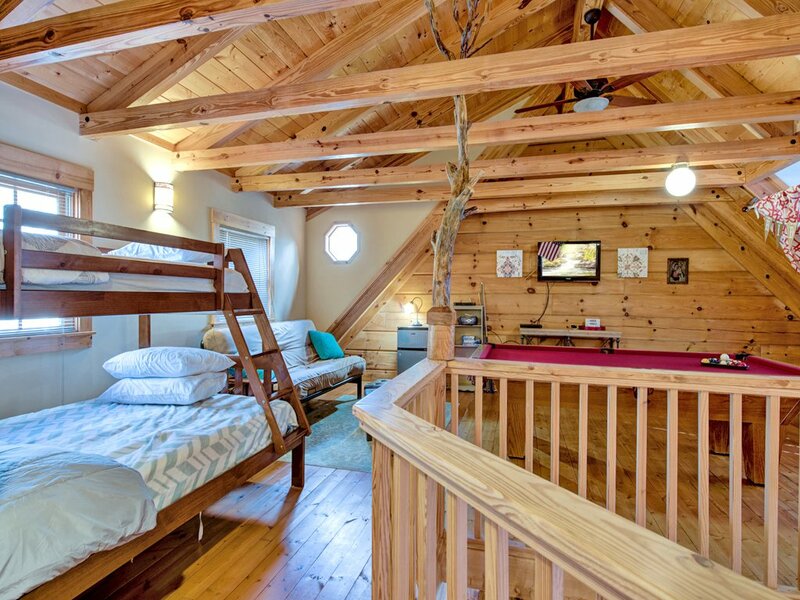 What’s more, the game room can sleep up to five people: two on the futon and three on the twin-over-double bunk beds. 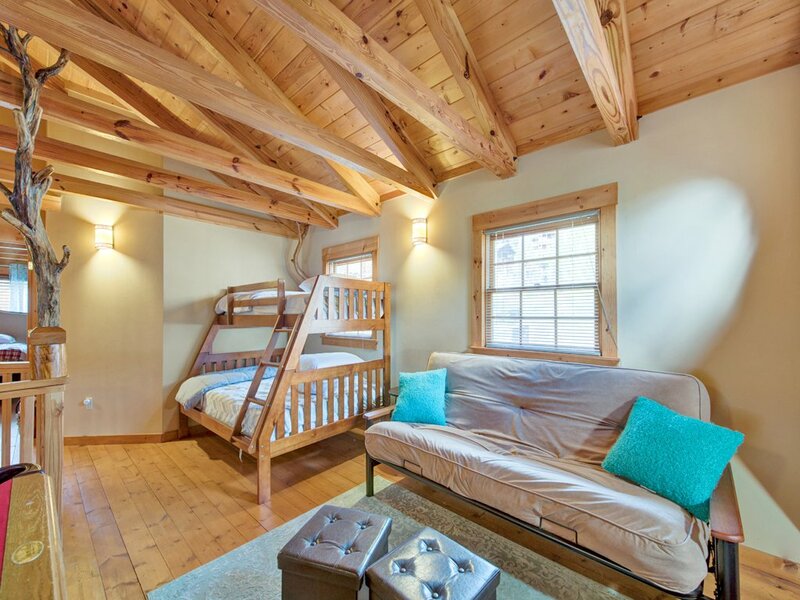 The loft is also home to the master bedroom. 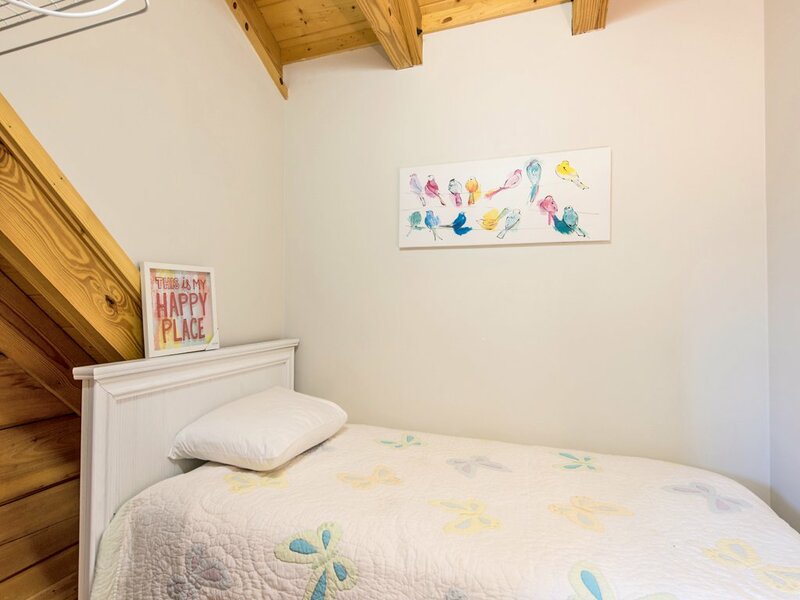 Spacious and airy, with a beamed cathedral ceiling, this room includes a king-size bed, a flat-screen TV, loads of storage, and a separate sleeping nook with a twin bed that’s perfect if you’re vacationing with a little one. 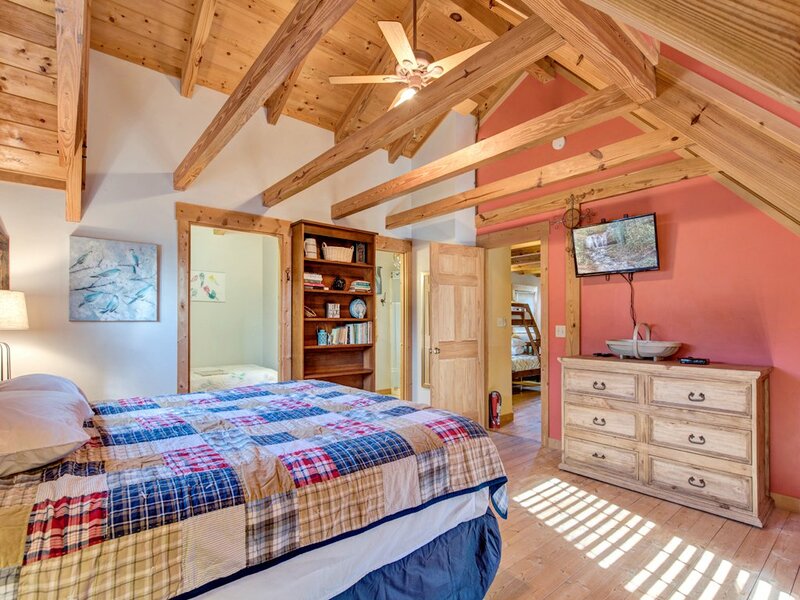 The other two bedrooms are on the main floor. 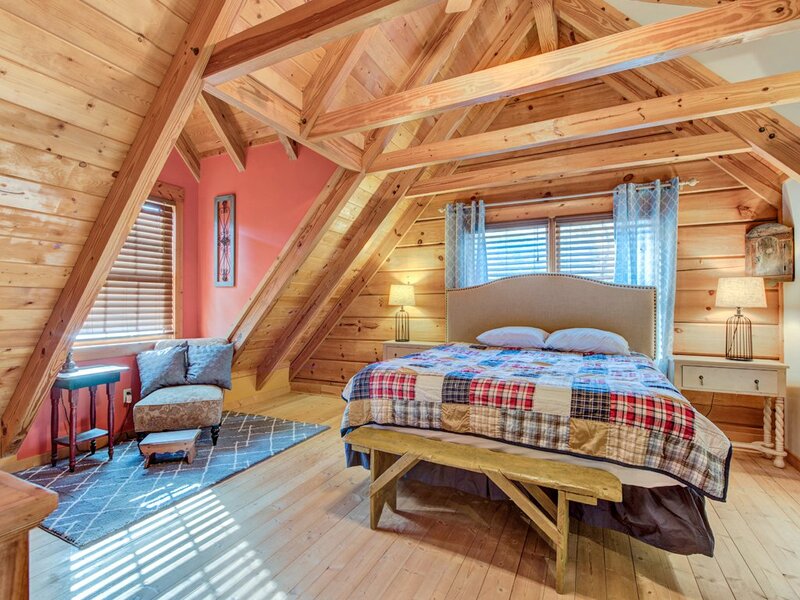 One features a queen-size bed, making Black Bear Hideaway well suited for two couples or families vacationing together. 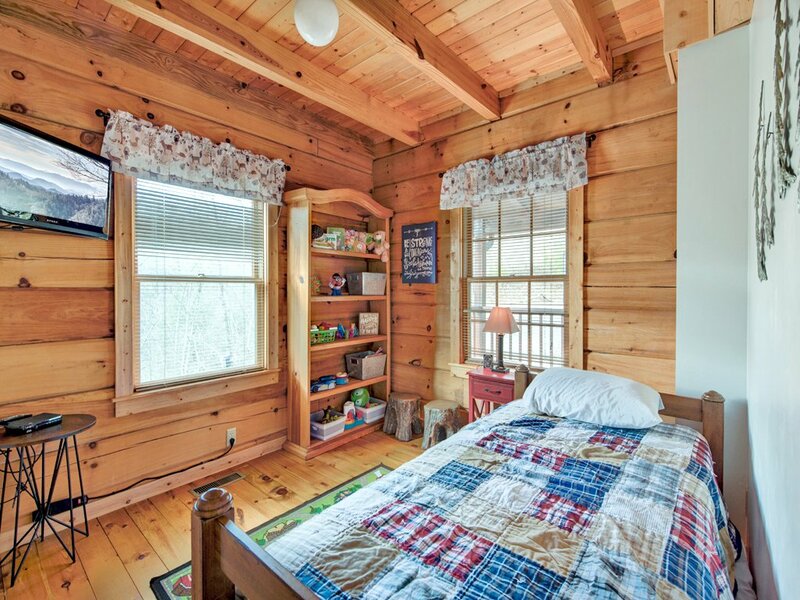 The remaining bedroom has a twin bed with a trundle. 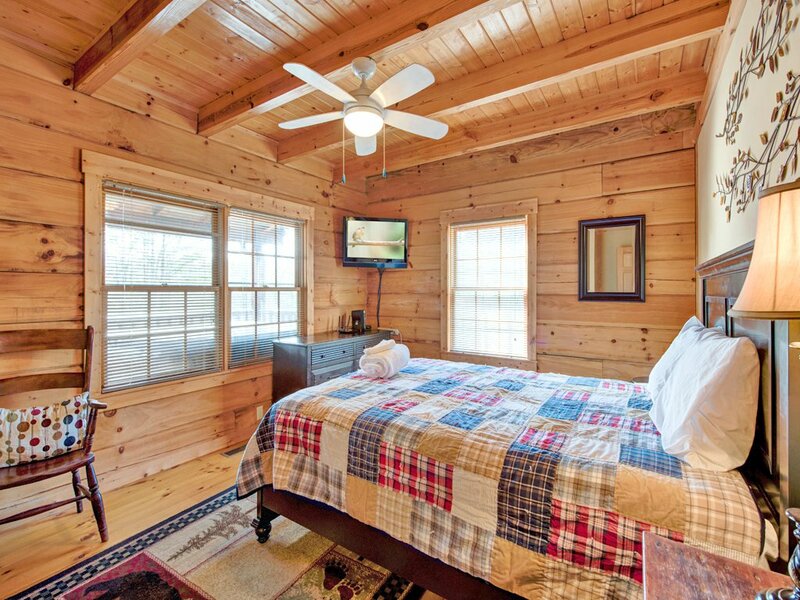 Both bedrooms, like the upstairs master, have a flat-screen TV and generous storage. 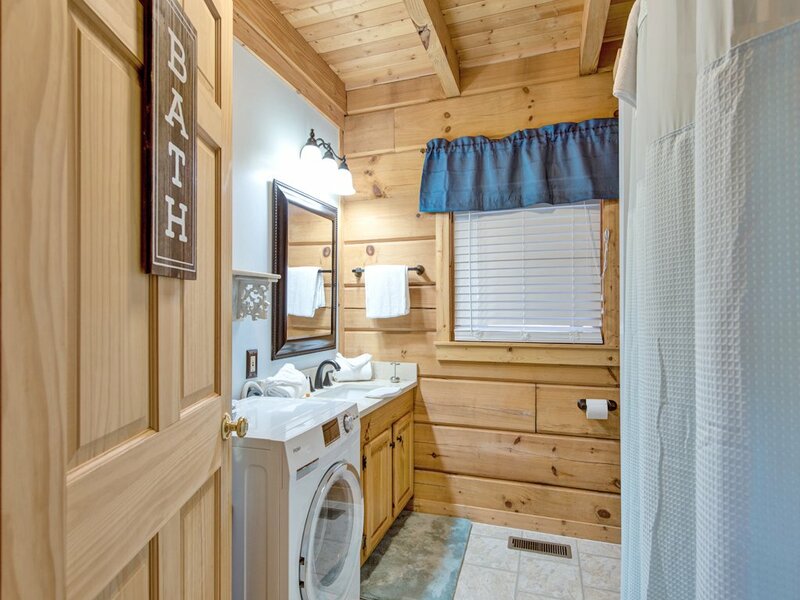 There’s a full bathroom on each floor; the main floor’s bathroom includes a washer and dryer for added convenience. 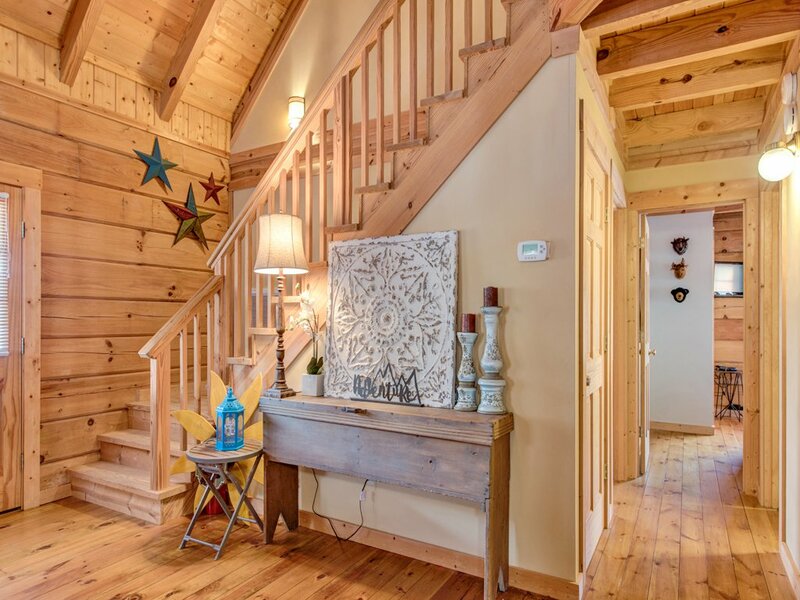 Any time of year, however, you’ll find plenty to do just beyond your front door. 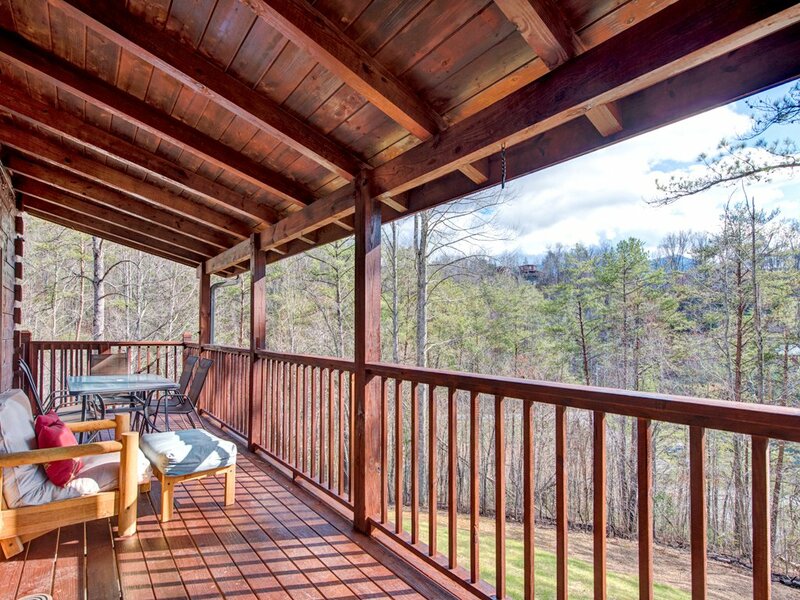 Within ten minutes you can drive to the Great Smoky Mountains National Park, with its wildlife, wildflowers, and waterfalls, and Wild Bear Falls Water Park. 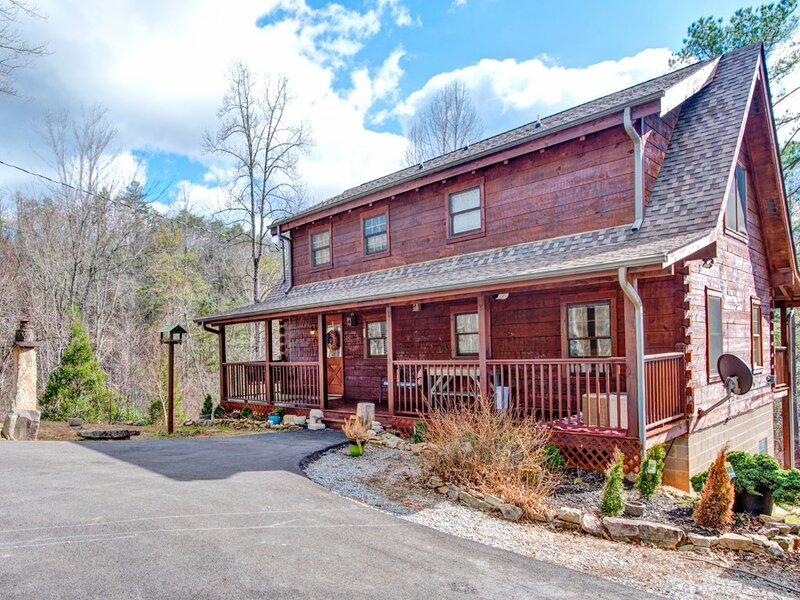 Also just ten minutes away is downtown Gatlinburg, home to thrill rides, the Guinness World Records Museum, an aquarium, mini golf, arcades, and a tram that will carry you over the town to Ober Gatlinburg Ski Area and Amusement Park. 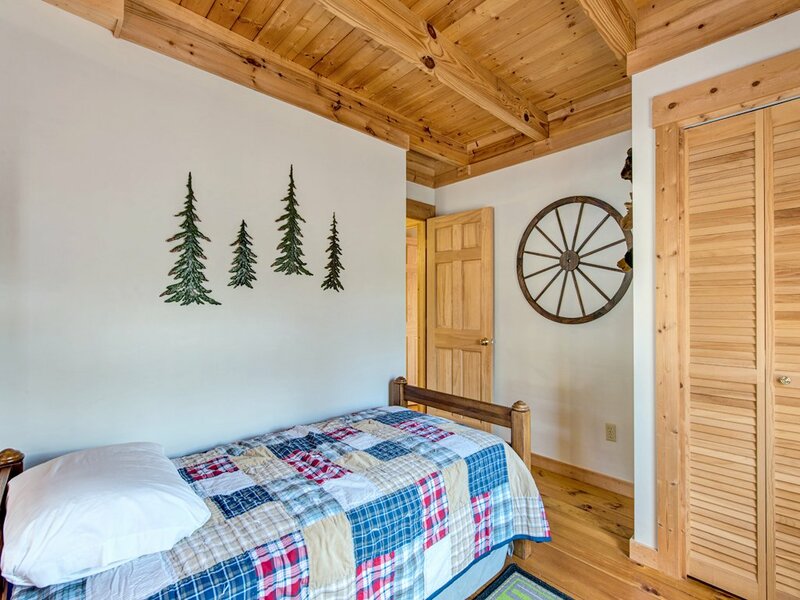 What’s more, the attractions of Pigeon Forge, which include Dollywood and the Titanic Museum, are no more than a half-hour away. 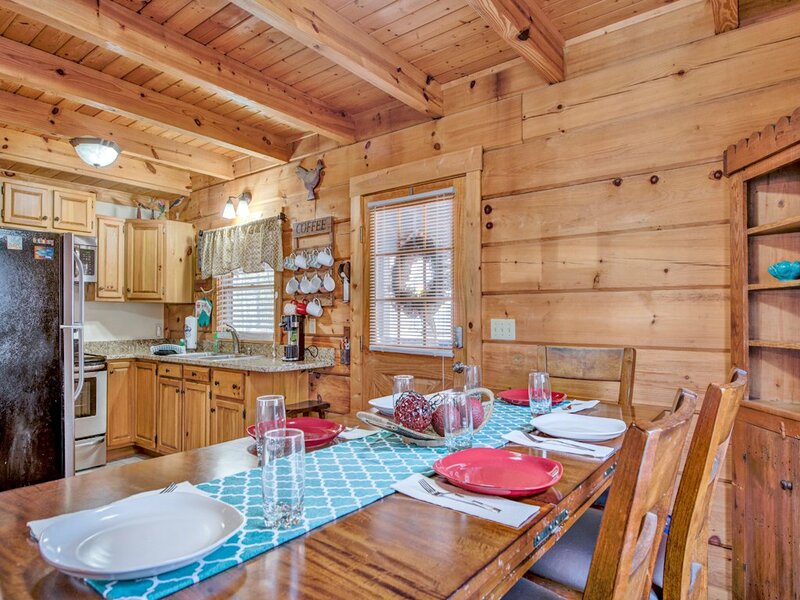 Close to all the action yet blissfully bucolic and peaceful, Black Bear Hideaway really is the best of all worlds—and don’t you deserve the best? So book your stay today, before someone else beats you to it.